A Democratic Unionist Party MP is on a mission to persuade people to "keep Christ in their Christmas". 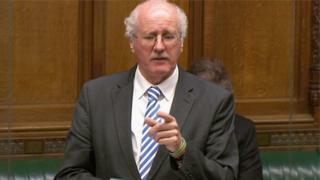 Jim Shannon has tabled a motion in the House of Commons about the "real meaning" of Christmas. It also wishes "everyone in this United Kingdom of Great Britain and Northern Ireland a very Happy Christmas and a blessed New Year". Although it is the season of goodwill, the Early Day Motion may not go any further, as few are actually debated. Northern Ireland's DUP came to prominence in the UK last year, after Theresa May lost her majority in June's general election. The prime minister made a deal with the DUP and its 10 MPs agreed to back her minority government in key Commons votes under a confidence-and-supply agreement. In return, there will be £1bn extra for Northern Ireland over two years. Mr Shannon, who is MP for Strangford, has so far received support for his motion from four fellow DUP MPs, Paul Girvan, David Simpson, Gavin Robinson and Emma Little-Pengelly. His motion states "that this House recognises the real meaning of Christmas being the celebration of the birth of Christ. "(It) urges people to remember to keep Christ in their Christmas and to use the time to show love to family, friends, neighbours and community alike. "And takes the opportunity to wish everyone in this United Kingdom of Great Britain and Northern Ireland a very Happy Christmas and a blessed New Year." Mr Shannon tabled a similar motion last year, in which he and other MPs offered Christmas wishes and reaffirmed the "right of every person in this country to use the phrase Happy Christmas".